2. Creepy crawlies wearing wigs. 4. The most evil man in the world. 5. Actually, anyone named Alan. 6. Alan deciding to become a pirate and destroy the world. Alan is Wilf's self-styled evil lunatic next-door-neighbor. He has a grumpy robot sidekick and a silent, right-hand-dog, Kevin Phillips. All in all, he is kind of ridiculous. But when Alan decides that pirating is an excellent way to destroy the world, Wilf knows he will have to overcome his fear of parrots and walking the plank to stop him . . .
Georgia Pritchett is a comedy writer who has written for a number of TV comedies and comedians including The Thick Of It, Veep, Miranda, Have I Got News For You, Smack the Pony, Graham Norton, Jo Brand, Paul Merton, Lenny Henry, Ronnie Corbett, Wallace and Gromit and several other real, fictional and occasionally plasticine people. 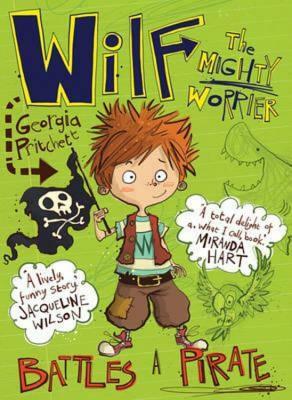 Wilf the Mighty Worrier is Georgia's first work for children. She lives in London with her husband and two children. "Wilf The Mighty Worrier could not be more charming or hilarious and I'm not just saying that because I'm a worrier myself who comes from a long line of worriers and wow, I really wish this sentence was shorter. I am saying that because it's true. Georgia Pritchett is a marvelous writer who has written a marvelous book. Period."